I’ve had this super easy and quick peony lampshade on the blog since before my daughter was born, but it has held up so well and continues to be a large focal point in her room, I just had to take some new photos of it (especially since the Pottery Barn Kids lamp this version was inspired by is no longer for sale) and talk about how well this lampshade has held up. In short- it’s been fabulous! I thought that by using hot glue, the glue might melt and fall off the shade overtime- but I have has absolutely zero problems with it. I also feared that our incredibly dust-prone house (welcome to Colorado) the white flowers might discolor – especially since this lamp sits right by her window. It still looks just as great as day 1! Want to know how I made it and where I found the materials for a great price? Click page 2 to find out! It is really SOOO easy! 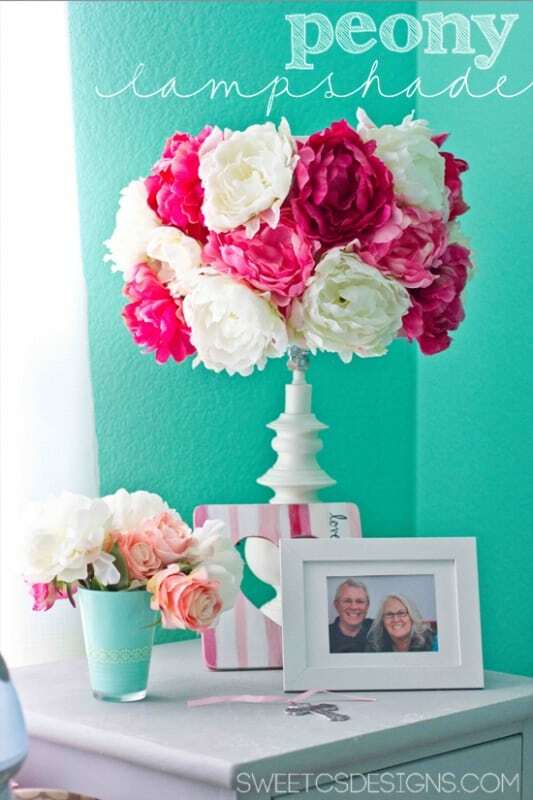 Your lamp is so much prettier than the Pottery Barn version….! I like yours way better than the PB lampshade. Thanks for sharing. Wowww. Yours is way better than the PB one. Yours look fuller and much more prettier. Nice work!!! I love the fact that you can do this one over when you want a change. That’s being practical. I love the fact that you do this one over when you want a change. That’s being practical. YOUR lampshade looks so much nicer than the PB one! Their’s looks tired and wilted, yours is so lucy and full! Great job! Thanks so much! I grabbed your button! I am always glad to have people grab one pic with a link to my projects, you have some great finds listed! Oh I love this! I actually like yours much better than the PBK one. Yours is much more colorful, & I love that your base is more detailed. Thanks for sharing! I can’t wait to try it out myself! That is totally adorable!! I would love for you to share this (and any other creations) at “Pin It & Win It Wednesday” at http://www.cheapcraftymama.com! So cute! You did a great job. Love the fuchsia! Wow this is SO gorgeous! Great job- I love it! Visiting from the Catch a Glimpse party! So cute!!! I can’t wait to see the new bundle!!!! This is so beautiful, and I will be pinning it! And I’m on my way to Joann’s to pick up some flowers and a shade! Thanks for the inspiration! This is so cute! We are re-doing my daughters room now I think I may do this to put in her room. Thanks for the great post! This lampshade is gorgeous. Just looking at it puts me in a happy place. I’d love for you to come share your post at my link party. I can’t begin to tell you how much I LOVE this project Courtney! I’m loving every detail of Baby B’s nursery! so sweet. The wall color is lovely, not too much at all. And that lamp! Cannot wait to see it all come together :).